A talented aspiring drag queen (Craig Russell) shares an apartment with his best friend, a schizophrenic young woman (Hollis McLaren) hoping to keep her “bonecrusher” away by becoming pregnant and feeling alive inside. Peary writes that perhaps the popularity of this “funny, touching film” — based on a short story by Margaret Gibson — is “due to the fact that both [main characters] succeed in achieving their modest goals”. He notes that “at times it’s a sloppy film, poorly lit and edited in a manner that causes you to lose all track of time; but the characters are so likable and believably played” and “the direction and script… are so spirited and tender that you are willing to forgive it for not being as polished as a Hollywood production”. He lauds the film’s emphasis on eschewing conformity, and notes that the “picture shows that those who struggle to retain their ‘healthy brand of craziness’ in our dehumanized world can have a lot of fun”. 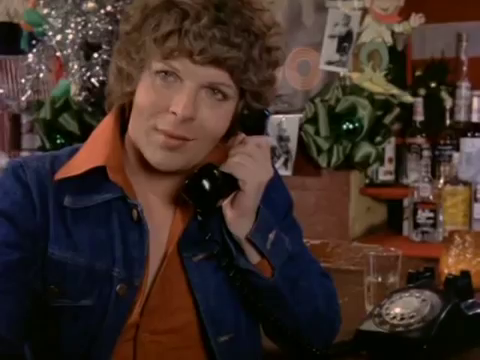 Peary specifically calls out Craig Russell’s “award-winning performance as Robin Turner, a character with great range” who is “kind-hearted, angry, witty, philosophical, moody, vulnerable to criticism, strong when he has to be, even heroic, extremely sarcastic, and harmlessly bitchy” — not to mention “dazzling” when he “does impersonations of Streisand, Channing, Garland, Bankhead, Davis, West, etc.” Indeed, the film is chock-a-block full of truly entertaining footage showing Russell doing what he does so well: we can easily understand why he expresses disdain and dismay early in the film when watching an amateur performer on stage, giving a bad name to his craft. Writer/director Richard Benner’s script heads in unusual directions, keeping us on our toes about what will happen next, and occasionally surprising us — but Russell’s friendship with McLaren trumps all, and provides the film with heartwarming continuity. Note: This film is profiled at length in Peary’s original Cult Movies book. 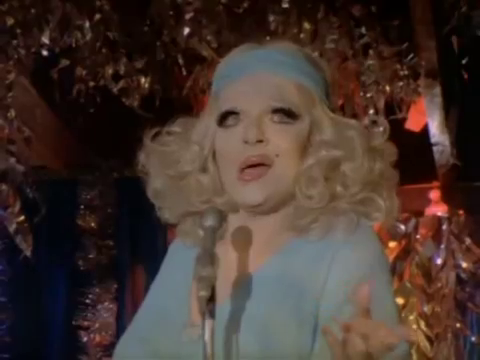 A once-must, for those who have a special interest in gay cinema history. Others may not find it an easy watch – not because it’s gay-related necessarily, but because it’s a flawed and awkward film. That said – I recall when I first saw it. (I don’t recall seeing it since its release – until now.) It was the year I moved to NYC. It was also a time (post-Stonewall riots) when few quality films about being openly gay were appearing mainstream. Gay people had a new freedom – the likes of which they hadn’t seen before – but that wasn’t really reflected much (or in all that satisfying a manner) in film. ~which is, no doubt, why I was more forgiving of ‘Outrageous’ (warts and all) when I first saw it. I wouldn’t say I consider the film ‘dated’ – but I would say it’s definitely ‘of its time’. I draw that distinction because, in a way, it was one of the right movies for the right time. It was ultimately uplifting and positive. But time has not been kind to the film. Now it’s rather obvious that the film was kind of thrown together. As noted, it’s “sloppy”, in a number of ways. The camerawork and editing are particularly slapdash. And the film is even confusing from time to time; things happen, and it can be hard to keep up (as though parts of the story were cut out). And some of the writing is just plain bad. Russell has the perfect face for a female impersonator and he molds it nicely to fit the various divas. Some of his club act is effective, but there’s really precious little of it on display (unfortunately). This is a film that may make you feel that you’d like it to be better than it is. 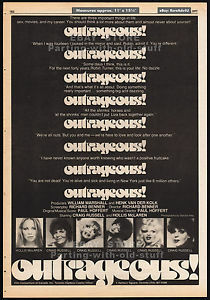 But forty years on since, we now have a larger variety of gay-related films to choose from, while ‘Outrageous’ seems destined more for obscurity as a curio.